I don’t normally watch hockey, or any sport, for that matter. But this past week, I watched four men’s hockey games during the Vancouver 2010 Winter Olympics. I was watching when we got crushed by the U.S., annihilated Russia, barely beat Slovakia and – with extremely bated breath – I was watching when Sidney Crosby scored the winning goal in overtime on Feb. 28, breaking the hearts of millions of Americans (especially that of U.S. goalie Ryan Miller). 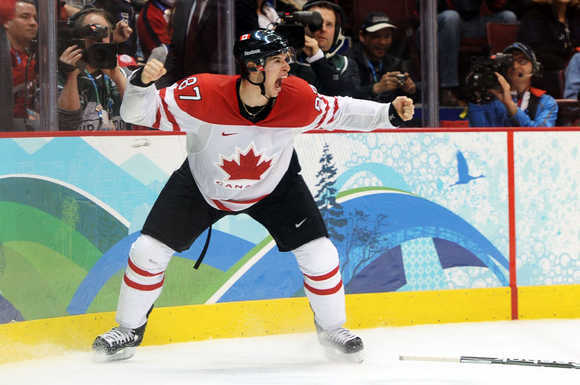 Sidney Crosby realizes he's won gold. I don’t want to be accused of fake, or temporary, or crowd-induced patriotism… also known as Olympic Hockey Fever. I also hope I don’t sound like a bad feminist because I didn’t follow the women’s hockey as closely (who also won gold!). But I have to admit I got really caught up in the drama, the suspense and the excitement, before and after we won. I couldn’t help it. When Zach Parise tied the game with just seconds left, I thought I was going to cry. I nearly stopped breathing while we were in overtime. I clapped so hard I hurt my palms when I realized we won. I typed Facebook and Twitter statuses without looking away from the T.V. And then I teared up at photos of crowds cheering and celebrating in Vancouver and Toronto. And yet, when I watched that first game against the U.S., I had to Google “power play.” I didn’t know who these players were, and I had to rely on the announcers to walk me through what was happening. What I did know, however, was that I hated Zach Parise and Ryan Miller with the passion of a thousand suns. And I knew that WE. HAD. TO. WIN. I don’t care that I’m a tourist hockey fan. Or an Olympic sheep. I enjoyed every moment – a whole series of exhausting, terrifying, exhilarating, and proud moments – that I experienced with millions of other Canadians. I’m glad that I can tell people what I was doing and where I was when Canada won gold. Being a part of all that was worth all the stress. And there was a lot of stress. Did you see that goal that tied the game? SCREW YOU, PARISE! And now back to my normal life.